First of all, apologies for the delay in getting an update out. I am still alive and making progress! Since I have not been able to put a lot of time into the project the past few weeks, I have been focusing primarily on polishing/optimizing existing features and squashing bugs. I also cleaned up my IndieDB downloads section so it’s not as cluttered with some of the really old files anymore. The newest release of RPG in a Box contains mostly bug fixes and optimizations, but read below for details on some of the more interesting changes that are included! The Map Editor now supports skyboxes for your map’s background! Skyboxes are particularly useful if your game uses the First-Person view mode. 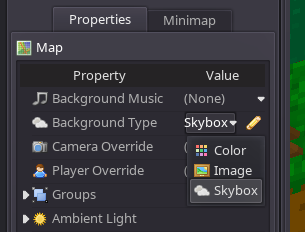 The skybox option can be selected from the Properties panel of the Map Editor. The “Background Type” property replaces the original “Background Color” property, and you now have the options of “Color” (fills the background with a solid color), “Image” (draws a static texture in the background), or “Skybox”. If you select “Image” or “Skybox”, a dialog will open that allows you to specify the necessary images. Shown below is the dialog for configuring a skybox. You will need an image for the top, bottom, front, back, left, and right side. As you specify each image, the preview at the bottom will be updated to show the unwrapped skybox. This can be used to confirm that the sides are assigned properly. In order to get the image files into your project, you can either copy the PNG or JPEG files into the “images” file of your game project folder, or use the new import feature that is detailed in the next section. Once you configure the skybox or image for your map’s background, it will be reflected in the 3D view of your map. If you are using a skybox, you will only be able to see the bottom image due to the camera angle (more camera options are planned for the Map Editor), but you can export your game to test it out. 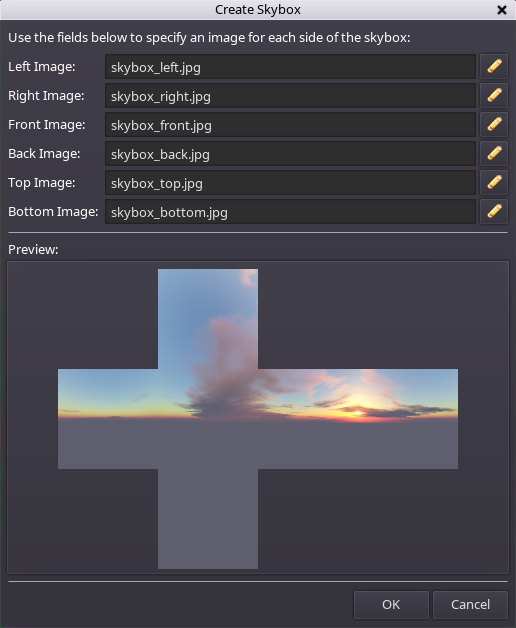 For now, you will need to either create your own skybox images or find some free ones online. In the future, some basic skyboxes will be included for you to use. Credit for the example skybox shown in the screenshots above goes to Roel Reijerse (Reije081.home.xs4all.nl). Another new feature is the “Import Resources” functionality. This can be accessed at any time from the main toolbar. A dialog will open where you can browse for a source folder to import resources from. Once a folder has been specified using the “Browse” button, the dialog will list any supported resources found in the source folder and group them appropriately. 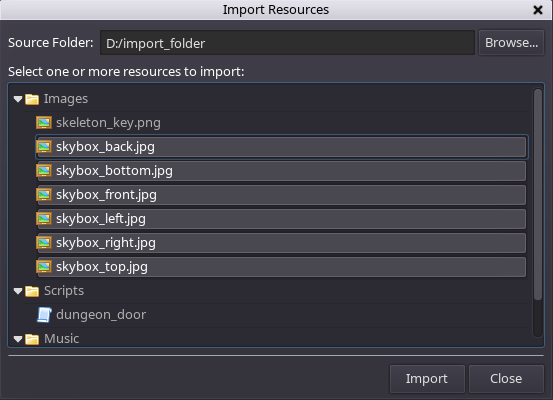 At this point, you can select one or more resources and then click the “Import” button to copy them into your game project. This same functionality can be accomplished by manually copying files using an external file explorer application if desired, however this should make it a bit simpler and the application will place the files into the appropriate locations automatically based on the file types. For now, this feature only supports images, scripts, and music files. It will be expanded upon at a later time to support additional resource types such as voxel models and maps, and the processing of sub-folders. The navigation/interaction grid lines have been optimized some. This particularly helps speed up the editing of large maps since the entire navigation grid is no longer refreshed when any changes are made, such as adding or deleting tiles. The navigation grid lines are now also stored with the map after being saved the first time and the minimap is only generated when necessary, both of which decrease the load time of maps in the Map Editor. You can now more easily change an entitiy’s group by using the new “Remove From All Groups” action on the right-click context menu while in Edit Mode. You can also use the new checkbox on the “Add Group” dialog to remove the selected entities from any existing groups before adding them to a new one. The full list of bug fixes and changes for v0.3.1-alpha can be found at the very bottom of this post. 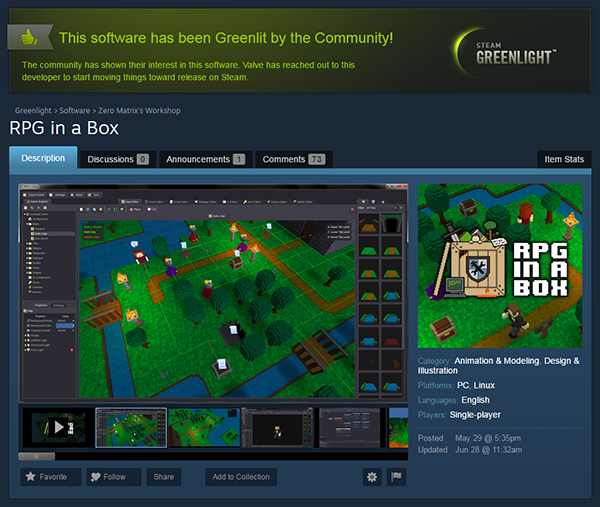 I am very excited to announce that RPG in a Box has been greenlit on Steam! I really appreciate the support that I have gotten so far! All of the encouragement and positive feedback I have received has been awesome. Although it has been greenlit now, I do not want to rush the process since I still have things that I would like to implement and polish before making it available to a wider audience as Early Access software. I also plan to take this time to update the documentation wiki and create a more comprehensive set of tutorials. That leads me to a related idea that I have been considering. Since it will be at least several months before everything is configured and the software is completely ready for Early Access on Steam, I am thinking about setting up a sort of “Pre-Early Access” on Itch.io and making use of their new Refinery toolset (Itch.io). With that in mind, I would like to create something along the lines of a “Founders Access” period. This would be geared more towards those who have a serious interest in creating a game with RPG in a Box and would be willing to test future alpha versions as they are released from that point forward. And of course, “Founders Access” would automatically qualify you for a Steam copy once it is available. I feel like this approach would be a great intermediate step before moving to the broader Early Access, and I could work closely with those interested to do some additional polishing and building out of any core features that I feel should be in place before moving forward.